A web article by Victor Hoagland, C.P. Do you pray? Do you pray often, or only occasionally? Is prayer important to you? I ask you these questions because prayer and praying are essential for your life of faith. 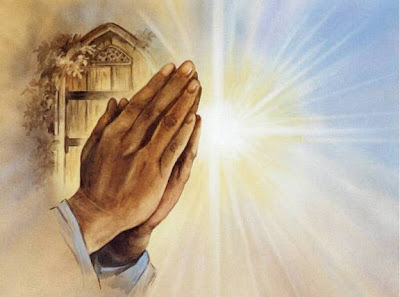 Like breath to the human body, prayer makes the spirit live. Without it, faith dies. On the other hand, a person who prays grows in spirit and life. Let me tell you some things that may encourage you to pray. To begin with, prayer is a gift of God. "Gift" is a good word to describe prayer, because praying is not something we can do of ourselves. " We do not know how to pray as we ought," scripture says. Prayer is a gift God must give. And God gives that gift generously, without consideration of our worthiness or our unworthiness. Sinners as well as saints can pray. People of every religious tradition receive the gift. In fact, every human being is able to pray. The Catholic Catechism reminds us of that by entitling its opening section on prayer The Universal Call to Prayer. Yes, all are called to pray. All receive the gift. And, surprisingly, sometimes those thought to be "ungifted" pray best and are graciously heard. That's the lesson Jesus taught in his parable about the Pharisee and the Publican who together went up to the temple to pray. The Publican, an outsider who thought himself unworthy of approaching God in prayer, was found more pleasing by God than the Pharisee, a professionally religious person, who prayed so effortlessly. Prayer, then, is God's gift to the strong and the weak, to the smallest child and frailest of the old. It's given to those who say, " I'm not really religious; prayer is beyond me." It's given to everyone, no matter who you are. That's not to say we can't refuse to pray or we can't neglect it. Like any gift, prayer must be received. If someone gives you a beautiful piece of clothing, you may use it or not. You may take it and wear it. Or, you can throw it in the back of your closet and never look at it again. The piece of clothing becomes a gift unused. "If you knew the gift of God," Jesus said to the Samaritan woman at the well. A Gift was there before her eyes, but she was blind to it. How tragic to go through life leaving the gift of prayer unused! Why does God give the gift of prayer? The main reason is because of love for us. God looks for intimacy with us. How strange that sounds! God all-sufficient, all-powerful, all-knowing, wishes to draw close, to communicate, to speak to us, to seek our response, to hear our prayer. It may seem unbelievable, but it is true. At the same time, by praying we fulfill the desire we have as human beings to know God. After all, we are made in God's image. Something in in our being thirsts for intimacy with God. That thirst is described in the psalms, O God, you are my God, for you I long. For you my soul is thirsting. Like a dry weary land without water... so my soul longs for you, my God. Something in us cannot be satisfied unless we are draw near to God. "Our hearts are restless," St. Augustine says, "until they rest in you." By praying, we rest in God. The church in her formal prayers often humbly acknowledges that prayer is God's gift and asks God to give and strengthen that gift in us. At the beginning of her daily prayers, the liturgy of the hours, the church prays two verses of the psalms. Simple, truthful words. I cannot open my lips in prayer unless God give me the gift. O God, come and assist me; help me that I may approach you. And God does give this beautiful gift. In prayer God comes and helps; God invites us into the divine presence where we can open our lips and our hearts. There God welcomes our slightest word or cry, our smallest effort. Delighting to give us the gift of prayer, God wishes that we come near to share our hearts and minds, our very life with One who loves us. Prayer is God's precious gift; cherish it always.